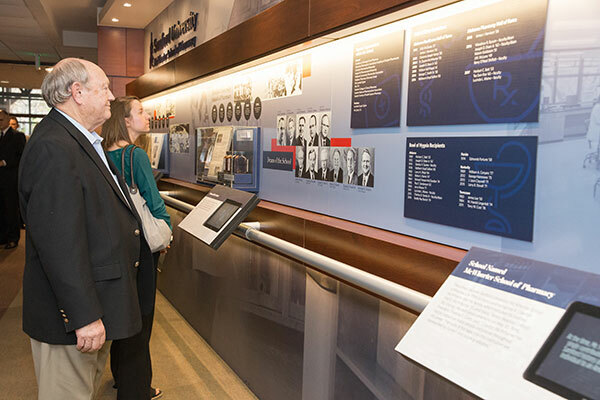 Samford University’s McWhorter School of Pharmacy concluded a year-long celebration of its 90th anniversary Feb. 15 with the dedication of the Pharmacy History Wall with alumni, faculty and friends in attendance. The Pharmacy History Wall is located adjacent to the Pharmacy History Gallery in the College of Health Sciences. “The purpose of the Pharmacy History Wall is to provide a space to celebrate the school’s amazing history and highlight all of the great things that have happened throughout the past 90 years,” said Michael Crouch, McWhorter School of Pharmacy dean. The design of the wall includes three sections that represent the school’s three distinct eras: The Howard College years (1927 to 1964), the Samford University years (1965 to 1995) and finally the Samford University’s McWhorter School of Pharmacy years (1996 to present). In addition to the various pictures and descriptions, the Pharmacy History Wall incorporates physical historic items, including a leather bound book of the school’s first curriculum from 1927. The wall also includes various touchscreens that allow visitors to look back at old yearbooks, class composites and historical photos—as well as photos from the school’s 90 for 90 campaign, where Crouch visited 90 alumni-owned or operated pharmacies in celebration of the school’s 90th anniversary. Through a designated plaque and video, the Pharmacy History Wall also honors the late Clayton McWhorter, for whom the school is named. “We would not be where we are today if it was not for the generosity and the transformational gift that was given by Mr. McWhorter,” Crouch said.